The term Canal Defence Tank is somewhat misleading. Just prior to the start of WW2 the War Office acquired the designs for a tank mounted night fighting searchlight. However the project was so secret that it was termed Canal Defence Tank to confuse the enemy, and very few outside of those units who operated the vehicle knew about its existence. The initial deployments were made on the Matilda in the desert. Later when 79th Armoured Division was formed it was thought that these vehicles might prove useful in NWE and the Grant was chosen as the carrying vehicle. The Grant had advantages over the Matilda in so much as the 75mm hull gun could be retained and the CDL turret and a MG added easily. A fake barrel was also added to the turret just to confuse the enemy. The CDL Brigade of 79th Armoured Division landed in Normandy in August of 1944 and there being no use for the vehicle the unit relinquished its role in October 1944. The first operations CDL Tanks took part in was the crossing of the Rhine. 24 Grants were allocated to 49 APC Regiment 79th Armoured Division for the operation. During this operation half of B Squadron was used in a static role to illuminate and shoot up the far riverbank at Rees providing a distraction to the actual crossing whilst the other half of the Squadron provided artificial moonlight to assist the LVTs in accurate direction crossing, spotting enemy midget submarines and sabotage swimmers/floating mines etc. Movement lighting was provided at both American and British crossing locations. CDLs were also deployed later in the crossing of the River Elbe. The light itself consisted of an arc lamp used in conjunction with reflectors, and could project a beam through a narrow vertical slit in the front of a specially made turret. It incorporated a mechanical shutter device to make the light flicker, the original intention being to dazzle the enemy. As the slit was only 2 inches wide the searchlight was well protected from any small arms fire. The carbon arc lamp only lasted for around 36 minutes but could be replaced very quickly by the crew. The light could be depressed or elevated 10% from the horizontal. At 1000 yards the light illuminated an area 340 yards wide and about 35 yards high. Beyond about 1500 yards and up to about 4000 yards the light only provided a limited amount of illumination more akin to moonlight. CDLS were used by both the British and Americans and the set provides an easy conversion for either the Grant or Lee Gun Tank. The set comes packed in the standard Resicast small sturdy cardboard box. The top of the box gives the product and manufacturers details and a picture of the finished kit. Inside there is an eight page set of instructions, the CDL turret which is cast as a whole, a set of the correct replacement wheels, a set of resin track, and several small bags of associated fixtures and fittings for the tank and turret along with a small PE fret. The parts are contained in separate zip plastic bags. Cast in a light grey coloured resin the set was free from any damage or cause for concern. The casting looks well detail and the set offers conversion options for the British middle or late production model or the middle or late US production model. The conversion set has been in existence for quite a number of years and as such has the older style type instructions with smaller text and drawings. If you have poor eyesight like me then a reading aid will help. The conversion is a fairly straight forward one. The turret has a wide plug you will need to remove so a sharp razor saw and modelling knife are a must. The alterations to the main hull are add-ons in the form of the new style bins used on the rear and LHS of the hull so should present no problem. An optional gun mount for the 75mm is provided for the US version and the PE set contains an engine grill for addition to the rear top hull plate. The remainder of the fittings and fixings are for the turret and include the mount for the dummy gun, pistol port, side door, rear box right and rear box left, periscopes, Besa MG , antenna mount and side box. For the US version, a 75mm gun mount is provided as mentioned, pistol port welded, gun shield periscopes, .50 ball mount and lifting hooks. So here it’s a case of choosing whether you want a US or UK style vehicle and choosing appropriately. 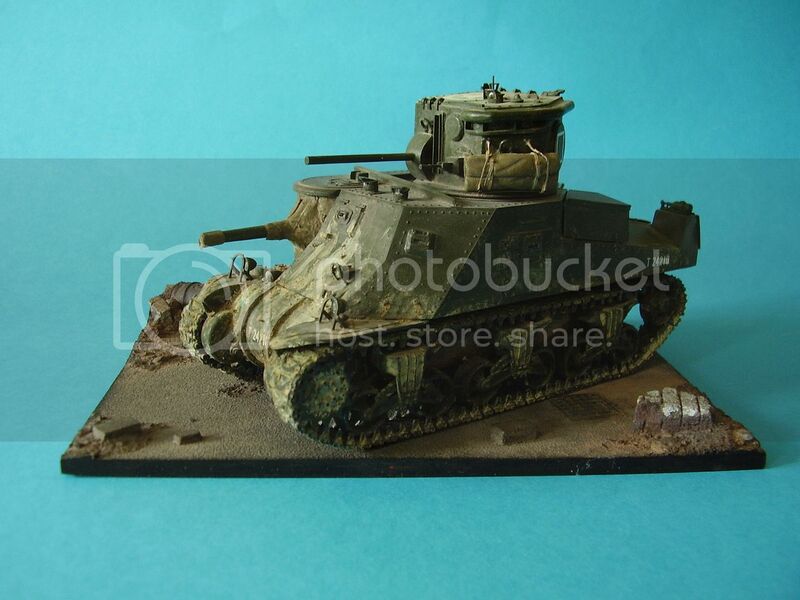 Although this is an old kit it still gives you what you need for a simple and effective conversion of the old Tamiya Lee/Grant. There are a number of reference pictures available and there appear to be a number of track styles and suspension types used on the vehicles so best refer to those if you want to build a specific vehicle. Also note the change in front fender style see on most of the British CDL tanks. It’s also worth noting the change of engine type that took place in late 42-early 43. The change occurred when the engine altered from the original Wright engine to the later Continental engine and depending on what you build this may alter the placement of the fishtail exhausts. (Thanks Paul). If I had an observation to make then it would be for a new PE Fret. There are a number of brackets and fixing that can be seen on the front hull of the British CDLs that are not included in the set and I found the stowage bracket P4 quite thin and difficult to work with. That said the remainder of the PE parts were excellent, and I’m already planning another build. This is a simple conversion that should be do-able for most modellers and might well be a very good starter kit if you are new to working with resin. I enjoyed the build a lot and it gives modellers an opportunity to add one of those ‘funnies’ to their collection at reasonable cost. A Build Log has been started on the forums. Highs: Excellent casting and detail with good alternative UK and US finish options. Lows: None not mentioned above.